I bought How to Rebuild Your Nissan/Datsun OHC Engine last week as a sort of early birthday present for myself. Its purchase completes my acquisition of the “trilogy” of glossy Datsun Z-Car books. The other two books are How to Modify Your Nissan/Datsun OHC Engine (lots of naturally-aspirated race-prep stuff; very little on turbocharging) and How to Restore Your Datsun Z-Car (an absolute gold mine for the would-be restorer, with step-by-step instruction on teardown and reassembly, parts diagrams and loads of photographs). Gotta get a set of the factory shop manuals next. The battery is removed from the car, but last night, in a kind of experiment, I hooked up my battery charger to the leads, turned the knob to “low charge” (5A or so) and turned the car on. Everything was as weak, as you’d expect from say, a dying battery, but it did something for me to be able to turn on the hazards, illuminate the lights and fiddle with the (original!) radio. Sometimes you just need to see a sign of life, you know? First time that’d been done in 8 years. I’ve been trying to determine whether or not the Z’s engine is original. Its status that way will have a big impact on how I go about restoring and/or upgrading the car. If it’s original, then I’d like to keep it original, which makes upgrading a bit more difficult (overboring the block from 2.4 to 2.8 liters isn’t quite as easy as I had thought it might be). If it’s a replacement engine, then all bets are off and, rather than rebuild it, I can swap it out for an engine that was 2.8l from the factory, the L28. So, how to establish the engine’s credentials? There’s an ID plaque (shown at top) affixed to the passenger side strut tower in the engine bay with the VIN and engine block number stamped on it. I hadn’t noticed it until now because when the Z was repainted in the late ’70s, the engine bay was blacked out and the ID plaque painted over. So, last night, I located the engine number on the block, shown above: 118555. I then removed the voltage regulator, allowing me to access and remove the ID plaque. I scraped as much paint off it as I was willing to last night (will eventually do the whole thing), but enough for me to read the block number listed: 110555. I’m almost positive it’s just a typo, but plan to ask those more familiar with these things for their take on the matter. Looks to me like you have a mis-stamped service block. 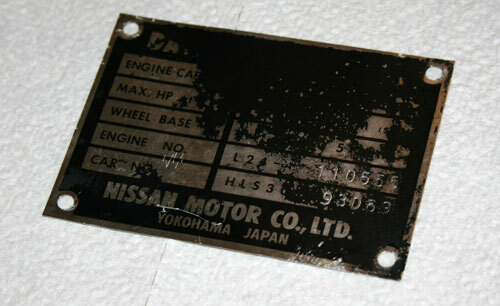 The numbers don’t have the familiar “cursive” bent normally associated with Nissan OEM Stamps. See the “L24?” The scripted numbers for the engine block should be similar, with the top section of the “8” looking somewhat like an onion with the green chopped off, if that makes any sense, along with the bottom section of the “5” being a bit more “open” and not a “reverse C” configuration. I have never seen a mismatched plate/engine from Nissan, ever. My surmise would be that you have a “service block” which arrived with no serial number in it, and generally the dealers left that blank when they installed it. Looks like someone sometime got a letter-number stamp and just put the numbers on your block. And they mucked it up. Unfortunately, what you have is most definitely not “matching numbers,” but if you had service history to show the swap/change you could argue the accident like you theorize. I’m querying my dad (the Z’s original owner) to hopefully get more of the story, if there is more to it. I just wanna know, you know? Interesting. I’m curious to see what you find out about the difference in numbering and am vicariously enjoying your discovery of the unknown about your Z (made even more interesting because you have been so attached to it and knowledgeable about it in the past). Keep us posted! Check the post for an update. If I can just drop in a compression-tested L28 instead of rebuilding the L24, this whole project would be a lot easier. If a bit less, well, sentimental. If that’s the right word. Hmm. The “110555” number is not correct for your car’s VIN…the number “118555” is correct. If you go to http://www.editgrid.com/user/mlwilliams/Z_Car_Registry and scroll down to the “93,000” vins, you will see that the 2nd number is in the correct range for when your 240 was built. For example, HLS30-91676 was built with engine number L24-115314, and HLS30-95783 used L24-120377. The numbers on Nissan engines were stamped at the time of manufacture and then installed later on the assembly line (that’s why engine numbers don’t match VINs). I f your dad was the original owner he would’ve known why (or if) the engine was replaced. I have seen one 240 that had the engine replaced under warranty due to oil pump failure, and it was stamped with a number about 20,000 later than the number on his engine compartment plate. I would rebuild your L24 and tell people to shove it if they don’t like the curve of your engine’s stamped numbers. Just my two cents. That registry is a great find, and definitely answers the VIN/block number mismatch question. Thanks for that. Amazing that the VIN plate is wrong. About the engine: Fortunately, after getting it running and driving, it won’t need to be rebuilt, at least not immediately. That was a huge relief.